The exceptionally rich plant wealth of the Cape had long been recognised by botanists, and after considerable lobbying for a botanical garden, Parliament handed over to the Trustees of Kirstenbosch part of the estate left by Cecil John Rhodes for this purpose on 1 July 1913. Thus began Kirstenbosch, one of the great botanical gardens of the world. The well watered mountain slopes on which it stands had previously been used by Khoi and later by colonists. Visitors today can still see the remnants of the hedge of wild almond (Brabejum stellatifolium) planted by Jan van Riebeeck in 1660 an attempt to keep them apart. The name Kirstenbosch for this land predates 1795, but its origins are not clear. Another well-loved feature of the Garden which is over 200 years old is Col. Bird’s bath in the Dell. 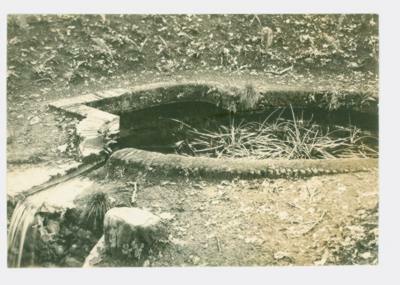 It was built of small bricks, in the shape of a bird at the source of a strong spring, by Col. Christopher Bird, Deputy Colonial Secretary while he was briefly owner of Kirstenbosch in 1811/1812. The first years of the garden saw a great flurry of activity. A great deal of clearance of alien trees and scrub from the neglected site was required. A nursery site was selected (at the foot of the Dell, beside Bath stream), paths, lawns and beds were laid out and some rustic bridges and seats made. An informal landscape style was deemed more suitable to a site of such grandeur. Various access roads and staff cottages were also built. Planting commenced, with several species being planted for their economic uses. 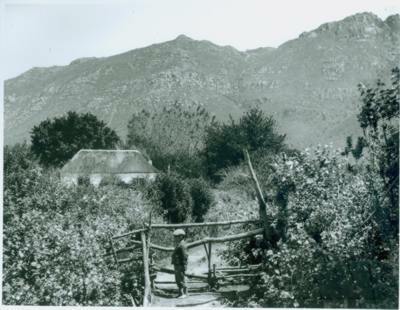 Early developments which are still visible today, (albeit a bit changed) are the cycad amphitheatre and the Dell, the Koppie (which was planted with aloes to begin with) , Mesemb Garden and Main Lawn with its pond, and the Director’s house (1914- now Kirstenbosch Manor), and the small dam to store water in Nursery stream. The site contained the remains of several old buildings including the Eksteen farmhouse, which was derelict by the time the Garden started. Today the site is a marquee lawn, but a tea house stood there for many years. 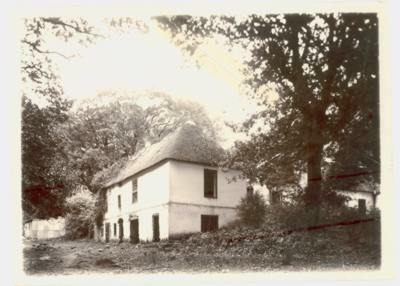 There was also a cottage (photo below) which became the first curator’s cottage and later the ranger’s house, across the main path from the pond. In the early years, several structures were erected in the Dell, but they have gone too. Disaster struck the young garden when the dynamic first director, Prof Pearson died in November 1916 at a young age from overwork and pneumonia. His grave is a feature of the garden today.